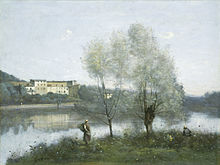 Corot, c. 1867: 'Ville d'Avray', oil-painting on canvas; current location: National Gallery of Art, Washington D.C. I have learned from experience that it is useful to begin by drawing one's picture clearly on a virgin canvas, first having noted the desired effect on a white or gray paper, and then to do the picture section by section, as immediately finished as one can, so that when it has all been covered there is very little to retouch. I have noticed that whatever is finished at one sitting is fresher, better drawn, and profits more from many lucky accidents, while when one retouches this initial harmonious glow is lost. I think that this method is particularly good for foliage, which needs a good deal of freedom. The first two things to study are form and values. For me, these are the bases of what is serious art. Color and finish put charm into one’s work.. ..it seems to me very important to begin by an indication of the darkest values (assuming that the canvas is white), and to continue in order to the lightest value. From the darkest to the lightest I would establish twenty shades.. .Never lose sight of that first impression by which you were moved. Begin by determining your composition. Then the values – the relation of the forms to the values. These are the basis. Then the color, and finally the finish. I am staying on in Geneva, this charming city. With each step I discover delightful motives. How pleasant it is to work here. And the light is just the way I like it, full of delicate nuances. My spirits.. ..now lean towards sadness and melancholy. I too am beginning to feel my age. Then, as one moves on in life sorrows multiply, and necessarily it is harder to keep cheerful.. .[I experienced] violent disappointments, that I might even call grief. 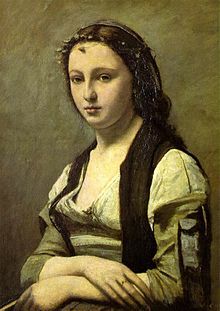 this is one of the very few negative expressions by Corot; he is then 49. I am never in a hurry to reach details. First and above all I am interested in the large masses and the general character of a picture; when these are well established, then I try for subtleties of form and color. I rework the painting constantly and freely, and without any systematic method. Be guided by feeling alone. We are only simple mortals, subject to error; so listen to the advice of others, but follow only what you understand and can unite in your own feeling. Beauty in art is truth bathed in an impression received from nature. I am struck upon seeing a certain place. While I strive for a conscientious imitation, I yet never for an instant lose the emotion that has taken hold of me. Reality is one part of art; feeling completes it.. .Before any site and any object, abandon yourself to your first impression. If you have really been touched, you will convey to others the sincerity of your emotion. You know, a landscape painter's day is delightful. You get up early, at three o'clock in the morning, before sunrise; you go and sit under a tree; you watch and wait. At first there is nothing much to be seen. Nature looks like a whitish canvas with a few broad outlines faintly sketched in; all is misty, everything quivers in the cool dawn breeze. The sky lights up. The sun has not yet burst through the gauze veil that hides the meadow, the little valley, the hill on the horizon.. .Ah, a first ray of sunshine! The whole landscape lies behind the transparent gauze of the fog that now rises, drawn upwards by the sun, and as it rises, reveals the silver-spangled river, the fields, the cottages, the further scene. At last one can discern all that one could only guess at before.. .The sun is up! There is a peasant at the end of the field, with his wagon drawn by a yoke of oxen.. .Everything is bursting into life, sparkling in the full light – light, which as yet is still soft and golden. The background, simple in line and harmonious in colour, melts into the infinite expanse of sky, through the bluish, misty atmosphere. The flowers raise their heads the birds flutter hither and thither.. .The little rounded willows on the bank of the stream look like birds spreading their tails. It's adorable! And one paints! And paints! I thank heaven that I was born in the same century as this remarkable artist [= Daubigny ]. He [ Delacroix ] is an eagle, I am only a lark. It is this book ['The Imitation of Christ'] that has helped me lead my life which such serenity and has always left me with a contended heart. I has taught me that men should not puff themselves up with pride, whether they are emperors, adding this or that province tot heir empires, or painters who gain a reputation. You can see the pains I take to hide the attachment [of the muscles] at the clavicles and sternum, to soften the modeling of the ribs where it seems that the breasts just begin to swell; I try to go about it entirely differently from the usual way, which is above all to show what one knows. As this is not an anatomy lesson, I must bind together as seen in nature everything covering the armatures that make up and support the body, in order to put down only what I experience faced with these tissues of flesh that let one sens the blood beneath, while they reflect the light of the sky. In a word, I must bring to the painting of that breast the same artlessness I would employ in painting a bottle of milk. I spent the winter [1859-1860, when he was painting 'Orfée et Euridice'] in the Elysian fields, where I was very happy; you must admit that if painting is a folly, it’s a sweet folly that men should not only forgive but seek out. If my time has come I shall have nothing to complain of. For fifty-tree years I have been painting; so I have been able to devote myself entirely to what I loved best in the world. I had never suffered poverty; I had good parents and excellent friends; I can only thank God. ..and, to tell the truth, I find it very difficult to like new art. It is only lately, and after having been unsympathetic for a great while, that I at last understood Eugene Delacroix, whom I now think a great man. At the head of the modern landscape school stands M. Corot.. .Clearly this artist has a sincere love for nature and knows how to study nature with as much intelligence as love. The qualities that shine forth in him are so emphatic – because they are rooted in his soul and his nature – that the influence of Mr. Corot can now be detected in almost all the paintings of the young landscape painters. ..he [= Corot] knows how to be a colorist with a tone-range of little variety – and that he always achieves harmony even when using fairly crude and bright tones. His composition is always perfect. Thus in his 'Homère et les Bergers' no detail is unnecessary, nothing could be cut out; not even the two little figures walking away along the path..
One has to see a painter in his own place to get an idea of his worth. I went back there [to Corot's studio, after the official exhibition] and I appreciate in a new light the paintings that I had seen in the Museum and that had struck me as middling.. .He told me to go a bit ahead of myself, abandoning myself to whatever might come; this is how he works most of the time.. .Corot delves deeply into a subject; ideas come to him and he adds while working; it's the right approach. [at Charles Daubigny's place where] ..animated conversations on the direct study of nature or the comparative merits of Haarlem paint driers and thick oil paints were often interrupted bu bursts of merriment greeting a witticism of one of the guests, who included non other than Corot, Daumier, Geoffroy-Dechaume, etc..
My travelling companion [= Corot] has just abandoned me. He's a perfect Father Joy, this Father Corot. He is altogether a wonderful man, who mixes jokes in with his very good advice. [Corot] has the devil to seldom within him. However inadequate and even unjust this expression may be, I chose it as approximately giving the reason which prevents this serious artist from dazzling and astonishing us. He does astonish – I freely admit – but slowly; he does enchant – little by little; but you have to know how to penetrate into the science of his art.. ..an infallible strictness of harmony. Don't you think your Corot is a little short on temperament? I'm painting a portrait of Vallabreque; the highlight on the nose is pure vermilion. It is only in ceasing to be entirely true that the artist will cease rendering the precise effect that has struck him, and this is what happens to Corot all those times when, too eager to idealize, he gets lost in forms and colors that have no equivalent in nature. He [Corot] was always surrounded by a crowd of fools and I didn't want to get caught up in it. I admired him from a distance. Don't look to closely at Corot's figures.. ..his half-finished manner has at least the merit of producing a harmonious ensemble and a striking impression. Instead of analysing a feature one feels an impression. My dear Theo.. ..Yesterday I saw the Corot exhibition. It included a painting of the 'Mount of Olives'; I'm glad he painted that. On the right, a group of olive trees, dark against the darkening blue sky; in the background hills covered with shrubs and a couple of tall trees, above them the evening star. There are 3 Corot's at the Salon [in Paris], very beautiful, the most beautiful one, painted shortly before his death, 'Women cutting wood', will probably appear as a woodcut in 'L'Illustration or Le Monde Illustré'. He [= Theodore Rousseau ] does not carry us away, as Francois Millet, toward the sorrowing epochs of rustic life, to reveal their savage grandeur or gloomy solemnity.. ..he does not transport us as Corot, into the lands of twilight, where the light, the freshness and the shadow sing an aerial melody, whose last notes reach out into infinity. No: simple, strong, all impregnated with naturalism, he respects the exact relations of the trees, the animals, man and the sky. It will be hard to fill the place of the painter [ Corot ]; it will be impossible to fill the place of the man. What I like so much about Corot is that he can say everything with a bit of tree; and it was Corot himself that I found in the museum of Naples [in 1882] – in the simplicity of the work of Pompeii and the Egyptians. These priestesses in their silver-grey tunics are just like Corot's nymphs. The Dupré's [paintings] are superb and there's a Daubigny.. ..that I couldn't get enough of. The same goes for a small Corot [probably the painting 'Pond at Ville-d'Avray', late 1860's ], a stretch of water and the edge of a wood on a summer morning about 4 o'clock. A single small pink cloud indicates that the sun will come up in a while. A stillness and calm and peace that enchants one. He [Corot] is always the strongest, he has foreseen everything. Edgar Degas made this remark on Corot to Camille Pissarro, at the preview exhibition of the Jules Paton sale in Paris, 24 April 1883 and overheard by Corot's biographer Alfred Robaut . 'Adieu' he [ Daubigny ] said, 'adieu, I am going to see up there [after his death] whether friend Corot has found me any new subjects for landscape painting.' In this final thought for his art the last sigh of Daubigny was drawn. I believe Corot painted a tree better that any of us, but still I find him superior in his figures. He was a good kind man, mr. Daubigny. And mr. Corot too; he [= Corot] used to put on his blouse, light his pipe, and sit down to paint in the middle of the road like any workman. He had a merry word for all who passed and was a rare good fellow. Those were the times when Les Valléés [Auvers] were full of life. The light! [in the paintings of Délacroix ].. .There is more warm light in this interior [probably: 'Woman of Algiers'] of his than in all of Corot's landscapes.. I have lingered among the nymphs of Corot, dancing in the sacred wood of Ville-d'Avray. It was Corot who taught her [ Berthe Morisot, c. 1860-1864] to bathe in air her landscapes, her figures, her still-life compositions; it was he who taught her the difficult lesson of understanding values.